Greetings, truthseekers! The Purple Ninja has arrived! You have come expecting a story from Kentucky Blue Clay? A clever ruse! HoHO! The Purple Ninja once again defies expectations! Fear not, my friends! Kentucky is being safely held at a secure location, and will soon regain consciousness. 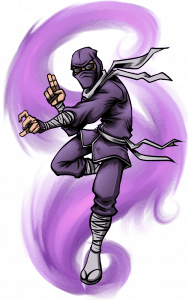 But first, the Dead Gentlemen have provided this forum for the Purple Ninja, wherein I shall dispense my profound wisdoms and helpful household hints. Bound by the ancient and deadly laws of etiquette, the Purple Ninja must accept their gracious offer. To repay this kindness, the Purple Ninja vows to avenge the deaths of these gentlemen, and see their killers brought to swift, punchful justice! HoHO! I have recently come into some mystical powers that may be of an infernal persuasion. 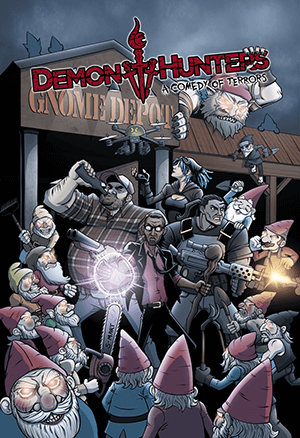 This is due to crazy random happenstance and definitely not from a bargain struck with a mid-level demon named Dougash’analah McKhan. If I wish to keep these sweet powers and not succumb to the new malevolent urges that seem to be welling up from a Stygian hole in my heart, what would you recommend? Aha! A moral quandary right from the get go! Purple Ninja is conflicted! The Code of the Purple Ninja demands that I come to the aid of all who seek my assistance. 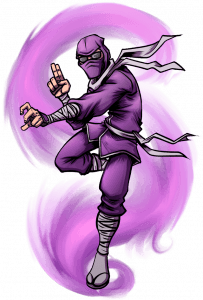 And yet, as an agent of the Brotherhood of the Celestial Torch, the Purple Ninja is duty bound to combat Evil in all its myriad forms. Despite your claims to the contrary, the Purple Ninja suspects you have invited this darkness into your life of your own free will! Philosophical Conflict, a lesser man might falter beneath your oppressive bulk, but you have met your match in the Purple Ninja! I shall provide the answers you seek, Mike G-san. In doing so, the advice of the Purple Ninja—like the mighty, orange construction cone—will surely divert you from the sinister path you have embarked upon, thus satisfying Purple Ninja’s obligations on both sides! Philosophical Conflict vanquished! Another victory for the Purple Ninja! HoHO! The allure of mystical powers is undeniable, even to one as disciplined as myself. The Hellspawn rely upon this temptation to lure mortals, tempting them into the corruption of their immortal souls. But these powers are a lie. A cheat. 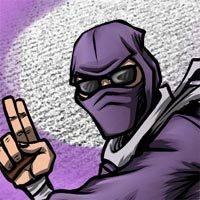 Purple Ninja needs no magic word to explode an enemy’s heart within his ribcage! Purple Ninja explodes his enemies hearts using muscle memory, precision finger strikes, and the Forbidden Secrets of Combat Acupressure, the old-fashioned way! HO! HohohoHO! HO! One need not resort to magic and bartering with devils to perform impossible feats. With proper training and focus, all things are possible! Tonight, as you slumber peacefully within your locked bedroom, a powerful sedative will be administered via blowdart, and you will be abducted from your home. Your loved ones will mourn your disappearance. The police will be baffled. In time, all will move on with their lives, and you will be but a memory. HohoHO! When you wake, several weeks from now, you will find yourself in a secluded village, in an unmapped valley, high in the Himalayas. The Dojo Arigato: the secret training center for the Purple Ninja. Here, you will be forcibly cleansed of your demonic powers. Purple Ninja has a guy for that. Through a grueling system of intense physical training, meditation, and passive aggressive taunting, you will be broken down—mind, body, and soul—and rebuilt in the Purple Ninja’s own image. You will find that with the discipline and physical mastery of the ninja, you will have no need for mystical powers. You will move unseen; step without sound; strike from the shadows and disappear in an instant. You will be the ultimate power. You will be ninja. Meanwhile, at the London offices of Cartwright, Waltham, Futterman and Moore, an elite squad of solicitors will be poring over the details of your bargain, searching for loopholes. Purple Ninja keeps them on retainer for just such an eventuality. Do not fear, Mike G-san! Cartwright, Waltham, Futterman and Moore are to Infernal Contract Law as the Purple Ninja is to the kicking of solar plexuses! HO! HohoHO! HoHO! Normally the Purple Ninja does not do this, Mike G-san, but I’ve got a good feeling about you. Okay, so maybe Purple Ninja has done this once or twice before. Per year. Month. Whatever. It’s not usually a complete disaster. Many have probably survived. Purple Ninja has high hopes for you! That is all for now, truthseekers! I have much to do to prepare for the newest student of the Purple Ninja. Unrelated note, does anyone know how to get burnt-in blood out of a violet gi? Purple Ninja is asking for a friend. The Purple Ninja is the greatest Demon Hunter of them all, master of the Seven Essential Forms of Martial Arts, and winner of the Kern County Fair’s pie-eating contest six years running. He is never far from those in need of ninjastic assistance. Just call his name, and he will appear! Note: Summoning of the Purple Ninja is for emergency purposes only. For non-emergencies, email purpleninja@deadgentlemen.com instead. October’s over. I’m crashing hard from my candy high, my clocks are cranked back for no particular reason, and the gray skies have settled over the Pacific Northwest for the duration. I don’t know about you guys, but I’m just not in the mood for the usual story this month. I know, you’ve come to rely on me to expose the true history of the world—the stuff they won’t/can’t/dare not teach you in school—but I just don’t have it in me this time. Tell you what; how about instead I tell you about the truth behind one of this countries supposed “Mysteries of History”? The actual truth. The mundane, vanilla, no monsters involved truth. Sounds boring? Well, yeah, kinda. But frankly, I think the real story’s way more interesting than the mystery on this one. 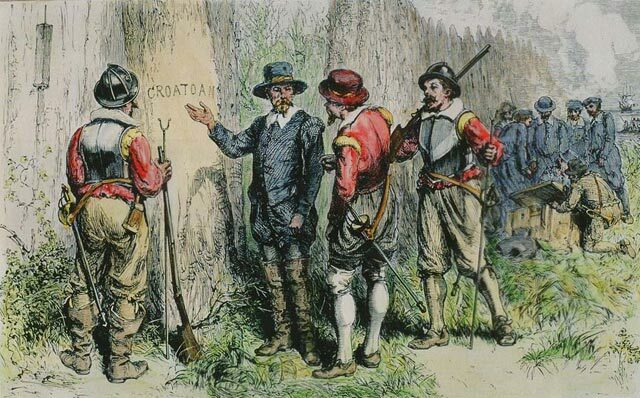 Go ahead, Google “Mysteries of History.” I guarantee you’ll end up no more than one click away from a story about the Lost Colony of Roanoke. If you’re reading my articles, you’re probably the type of person that’s heard of it before. It’s actually kind of hard to avoid these days. Any TV show with an ounce of the supernatural in its premise is gonna dive into the Roanoke well at some point. It’s just too juicy to pass up!